A naturally derived gel toothpaste to keep your pearlers squeaky clean. 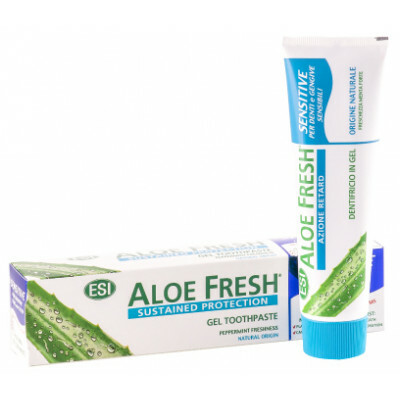 With its soothing action you’ll heal bleeding and sore gums, healing pain and making them stronger over time. Hydrated Silica, Sorbitol, Aqua, Sodium Lauroyl Sarcosinate*, Carboxymethyl Chitosan, Potentilla Erecta Root extract, Menthol, Citrus Aurantium Dulcis Fruit extract, Melaleuca Alternifolia Leaf oil, Sodium Hydroxymethylglycinate, Xylitol, Citric Acid, Limonene, Chlorophill. I was a bit sceptical at first, but this toothpaste really is the best. The fact that it doesn't have any fluoride, is the major reason why I bought this but it really does the exact same thing as any other toothpaste. I really love this and I really love Aloe Vera products. I am surprised at how decent this natural toothpaste is. I hate using normal toothpaste and decided to switch to this product and I'm happy! Cleans my mouth better than normal toothpaste and doesnt leave that fluoride taste in your mouth. I really do recommend this one. This is the best toothpaste. Leaves my teeth smooth and clean and fresh. And it lasts long. This is quite expensive for a toothpaste but I keep using this brand regardless. I always had fluoride spots and they have faded drastically. Will never go back to normal toothpaste. Surprisingly my teeth actually started feeling more sensitive than usual so I switched back to the Himalaya brand. A lovely fresh, minty taste and my gums have not been red since I started using this. Pity it is so pricey. Great tastes great feels great. I buy this for my kids and I've seen that it removes that sticky tartar from the teeth. Bonus is that it does not contain any fluoride.